In the sixth part of his book, L'Arte Vetraria, Antonio Neri presents his recipes for enamels. These are a form of glass meant to be applied in thin layers like paint, and fired quickly. In the early seventeenth century, enamels were used to decorate both glass and gold. Neri does not present any methods specifically addressing technique or application, but he does leave a number of recipes. He also praises the talent of a good friend, who worked on glass in 1601, at the Casino di San Marco in Florence. "At that time, the task of scheduling furnace work fell to the outstanding Mr. Nicolò Landi, my close friend and a man of rare talent in enamel work at the oil lamp." Now, this is not only a difficult art but also necessary. We see ornate enameled metals in many colors, and they make a pleasant and noble sight; they entice others to look and take notice. In addition, enameling is one of the main segments of the glass field, and quite necessary. It seems to me to cause universal gratitude and pleasure, so I will endeavor to describe many ways to make all sorts of enamels, which are special materials in the art of glassmaking. They form one of its noble domains, not common, but a particular niche, and because this work is not lacking in substance, and is pleasant, useful, and necessary, I have made this present sixth book, for the satisfaction and benefit of everyone. Neri's interest in enamels seems to start with Nicolò Landi. 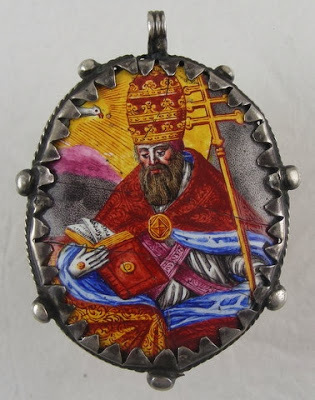 Within a couple of years, in 1603, the glassmaker’s friend Emmanuel Ximenes wrote from Antwerp to Neri in Pisa about the suitability of an enamel he had received from the priest, purposefully overloaded with color. "As far as the red glass, […] I am doing a test in enameling gold, because having such a thin layer of enamel, if it is not very full of pigment it would remain a pale color. […] If it will not grieve Your lordship, I would love to find out the composition." The implication is that Ximenes was working with his brother in law Baron Simon Rodriguez d'Evora, a famous jeweler and diamond dealer. Soon, Neri would join them in Antwerp, however, the evidence points to a working relationship with goldsmiths before his visit. "In Pisa, I made them [enamels] without [measuring] weights, but by rough estimate." 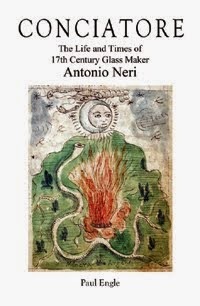 In fact, Neri mentions goldsmiths in virtually every enamel recipe in the book, and unlike other chapters, he makes no mention of Antwerp, but only of Pisa. As in all his endeavors, Neri pays close attention to ground truth; he is not as interested in presenting a tidy cut-and-dried recipe as he is in describing what is actually happening with the materials. You should add the material in four doses, stirring [the melt] thoroughly each time, and leaving the glass to incorporate the powder. The way to check that the color pleases you is by proofing it, and watching to see if it is sufficiently loaded. Stop adding powder and proceed to make a goldsmith's proof [on metal]; always examine the colors to get to know them by eye, as I have always done, because in this matter, I cannot give specific doses. Sometimes the powder will tint more, other times less, therefore you must practice with your eyes to understand the colors.